143:5.1 When the Master and the twelve arrived at Jacob's Well, Jesus, being weary from the journey, tarried by the well while Philip took the apostles with him to assist in bringing food and tents from Sychar, for they were disposed to stay in this vicinity for a while. Peter and the Zebedee sons would have remained with Jesus, but he requested that they go with their brethren, saying: "Have no fear for me; these Samaritans will be friendly; only our brethren, the Jews seek to harm us." And it was almost six o'clock on this summer's evening when Jesus sat down by the well to await the return of the apostles. 143:5.2 The water of Jacob's well was less mineral than that from the wells of Sychar and was therefore much valued for drinking purposes. Jesus was thirsty, but there was no way of getting water from the well. 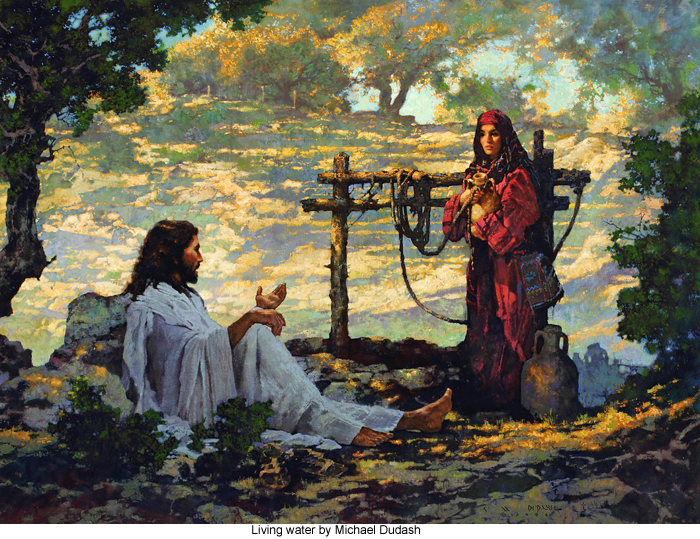 When, therefore, a woman of Sychar came up with her water pitcher and prepared to draw from the well, Jesus said to her, "Give me a drink." This woman of Samaria knew Jesus was a Jew by his appearance and dress, and she surmised that he was a Galilean Jew from his accent. Her name was Nalda and she was a comely creature. She was much surprised to have a Jewish man thus speak to her at the well and ask for water, for it was not deemed proper in those days for a self-respecting man to speak to a woman in public, much less for a Jew to converse with a Samaritan. Therefore Nalda asked Jesus, "How is it that you, being a Jew, ask for a drink of me, a Samaritan woman?" Jesus answered: "I have indeed asked you for a drink, but if you could only understand, you would ask me for a draught of the living water." Then said Nalda: "But, Sir, you have nothing to draw with, and the well is deep; whence, then, have you this living water? Are you greater than our father Jacob who gave us this well, and who drank thereof himself and his sons and his cattle also?" 143:5.3 Jesus replied: "Everyone who drinks of this water will thirst again, but whosoever drinks of the water of the living spirit shall never thirst. And this living water shall become in him a well of refreshment springing up even to eternal life." Nalda then said: "Give me this water that I thirst not, neither come all the way hither to draw. Besides, anything which a Samaritan woman could receive from such a commendable Jew would be a pleasure." 143:5.4 Nalda did not know how to take Jesus' willingness to talk with her. She beheld in the Master's face the countenance of an upright and holy man, but she mistook friendliness for commonplace familiarity, and she misinterpreted his figure of speech as a form of making advances to her. And being a woman of lax morals, she was minded openly to become flirtatious, when Jesus, looking straight into her eyes, with a commanding voice said, "Woman, go get your husband and bring him hither." This command brought Nalda to her senses. She saw that she had misjudged the Master's kindness; she perceived that she had misconstrued his manner of speech. She was frightened; she began to realize that she stood in the presence of an unusual person, and groping about in her mind for a suitable reply, in great confusion, she said, "But, Sir, I cannot call my husband, for I have no husband." Then said Jesus: "You have spoken the truth, for, while you may have once had a husband, he with whom you are now living is not your husband. Better it would be if you would cease to trifle with my words and seek for the living water which I have this day offered you." 143:5.5 By this time Nalda was sobered, and her better self was awakened. She was not an immoral woman wholly by choice. She had been ruthlessly and unjustly cast aside by her husband and in dire straits had consented to live with a certain Greek as his wife, but without marriage. Nalda now felt greatly ashamed that she had so unthinkingly spoken to Jesus, and she most penitently addressed the Master, saying: "My Lord, I repent of my manner of speaking to you, for I perceive that you are a holy man or maybe a prophet." And she was just about to seek direct and personal help from the Master when she did what so many have done before and since-dodged the issue of personal salvation by turning to the discussion of theology and philosophy. She quickly turned the conversation from her own needs to a theological controversy. Pointing over to Mount Gerizim, she continued: "Our fathers worshiped on this mountain, and yet you would say that in Jerusalem is the place where men ought to worship; which, then, is the right place to worship God?" 143:5.6 Jesus perceived the attempt of the woman's soul to avoid direct and searching contact with its Maker, but he also saw that there was present in her soul a desire to know the better way of life. After all, there was in Nalda's heart a true thirst for the living water; therefore he dealt patiently with her, saying: "Woman, let me say to you that the day is soon coming when neither on this mountain nor in Jerusalem will you worship the Father. But now you worship that which you know not, a mixture of the religion of many pagan gods and gentile philosophies. The Jews at least know whom they worship; they have removed all confusion by concentrating their worship upon one God, Yahweh. But you should believe me when I say that the hour will soon come-even now is-when all sincere worshipers will worship the Father in spirit and in truth, for it is just such worshipers the Father seeks. God is spirit, and they who worship him must worship him in spirit and in truth. Your salvation comes not from knowing how others should worship or where but by receiving into your own heart this living water which I am offering you even now." 143:5.7 But Nalda would make one more effort to avoid the discussion of the embarrassing question of her personal life on earth and the status of her soul before God. Once more she resorted to questions of general religion, saying: "Yes, I know, Sir, that John has preached about the coming of the Converter, he who will be called the Deliverer, and that, when he shall come, he will declare to us all things"-and Jesus, interrupting Nalda, said with startling assurance, "I who speak to you am he." 143:5.8 This was the first direct, positive, and undisguised pronouncement of his divine nature and sonship which Jesus had made on earth; and it was made to a woman, a Samaritan woman, and a woman of questionable character in the eyes of men up to this moment, but a woman whom the divine eye beheld as having been sinned against more than as sinning of her own desire and as now being a human soul who desired salvation, desired it sincerely and wholeheartedly, and that was enough. 143:5.9 As Nalda was about to voice her real and personal longing for better things and a more noble way of living, just as she was ready to speak the real desire of her heart, the twelve apostles returned from Sychar, and coming upon this scene of Jesus' talking so intimately with this woman-this Samaritan woman, and alone-they were more than astonished. They quickly deposited their supplies and drew aside, no man daring to reprove him, while Jesus said to Nalda: "Woman, go your way; God has forgiven you. Henceforth you will live a new life. You have received the living water, and a new joy will spring up within your soul, and you shall become a daughter of the Most High." And the woman, perceiving the disapproval of the apostles, left her waterpot and fled to the city. 143:5.10 As she entered the city, she proclaimed to everyone she met: "Go out to Jacob's Well and go quickly, for there you will see a man who told me all I ever did. Can this be the Converter?" And ere the sun went down, a great crowd had assembled at Jacob's well to hear Jesus. And the Master talked to them more about the water of life, the gift of the indwelling spirit. 143:5.11 The apostles never ceased to be shocked by Jesus' willingness to talk with women, women of questionable character, even immoral women. It was very difficult for Jesus to teach his apostles that women, even so-called immoral women, have souls which can choose God as their Father, thereby becoming daughters of God and candidates for life everlasting. Even nineteen centuries later many show the same unwillingness to grasp the Master's teachings. Even the Christian religion has been persistently built up around the fact of the death of Christ instead of around the truth of his life. The world should be more concerned with his happy and God-revealing life than with his tragic and sorrowful death. 143:5.12 Nalda told this entire story to the Apostle John the next day, but he never revealed it fully to the other apostles, and Jesus did not speak of it in detail to the twelve. p1615 -:1 143:5.13 Nalda told John that Jesus had told her "all I ever did." John many times wanted to ask Jesus about this visit with Nalda, but he never did. Jesus told her only one thing about herself, but his look into her eyes and the manner of his dealing with her had so brought all of her checkered life in panoramic review before her mind in a moment of time that she associated all of this self- revelation of her past life with the look and the word of the Master. Jesus never told her she had had five husbands. She had lived with four different men since her husband cast her aside, and this, with all her past, came up so vividly in her mind at the moment when she realized Jesus was a man of God that she subsequently repeated to John that Jesus had really told her all about herself.